So this post is exactly one month late. The post for my exciting meal for August’s Food and Wine Cover Recipe Challenge is late simply because it was summer and I was off galavanting, sorry folks, I have no excuses. But here it is at long last (September’s is coming too, I promise). When I realized the August issue of F&W was focused on vegetables a sense of dread washed over me. Really? No meat? Well there is some meat in the issue, but the emphasis on the awesome variety of creative dishes and flavours one can cook from ‘just’ vegetables really enchanted me. Despite my carnivorous instincts, I decided that this was a good opportunity to challenge myself and make a meal that consisted solely of vegetables. 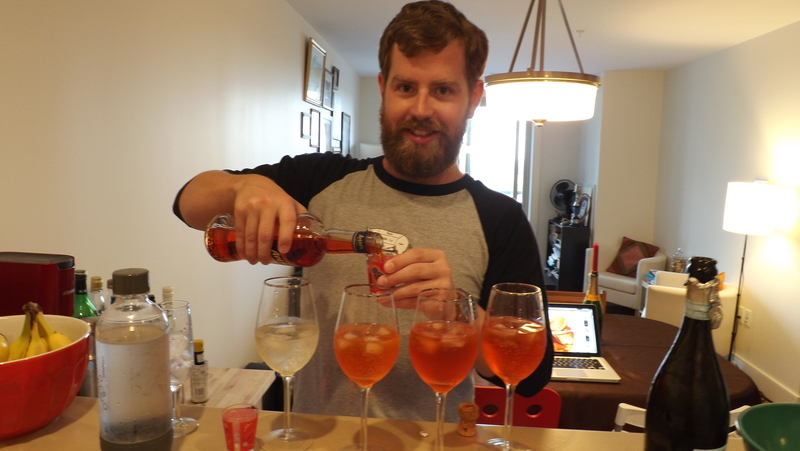 To start off the evening, Adam decided to put his newly acquired Aperol knowledge to good use and made Rosemary Aperol Spritz. I have had cocktails with Aperol before, but it is only recently while Adam and I have been experimenting with cocktails that we discovered how versatile and delicious this libation can be. The bitter orange liqueur hails from Italy and is a classic ingredient in many cocktails. 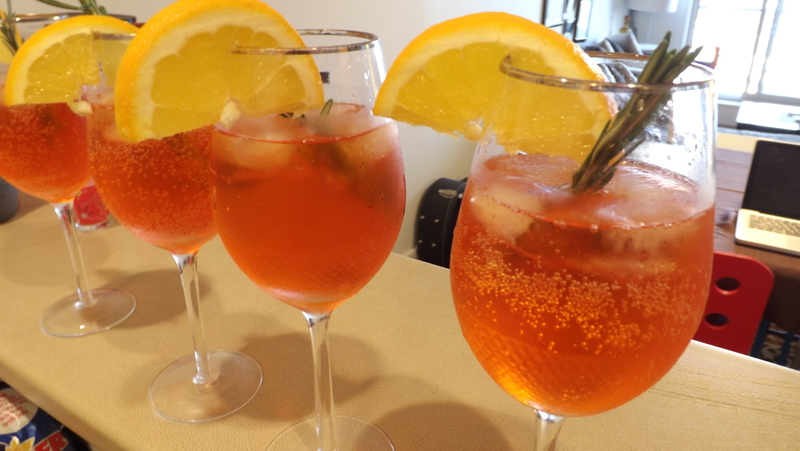 The drink consists of Prosecco, soda water, Aperol, and is garnished with rosemary and an orange slice. It was super delicious and the bitterness of the Aperol is crazy good with the rosemary. For this challenge, I decided that the cover recipe was best suited as the appetizer for the evening. 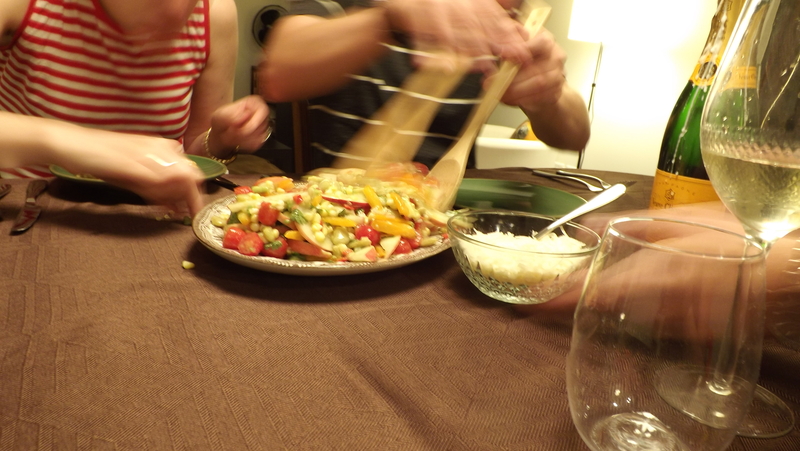 The Summer Vegetable Ceviche was very easy to make despite its total prep time (2.5 hours), and it was delicious. The recipe was simple: chuck a bunch of fresh veggies into a bowl with lime juice, oil, and sea salt, wait two hours, and voila, you have vegetable ceviche. The flavours of this pseudo salad were fresh and summery. I loved the creativeness of the dish and the use of a technique that is usually reserved for meat or fish preparation. 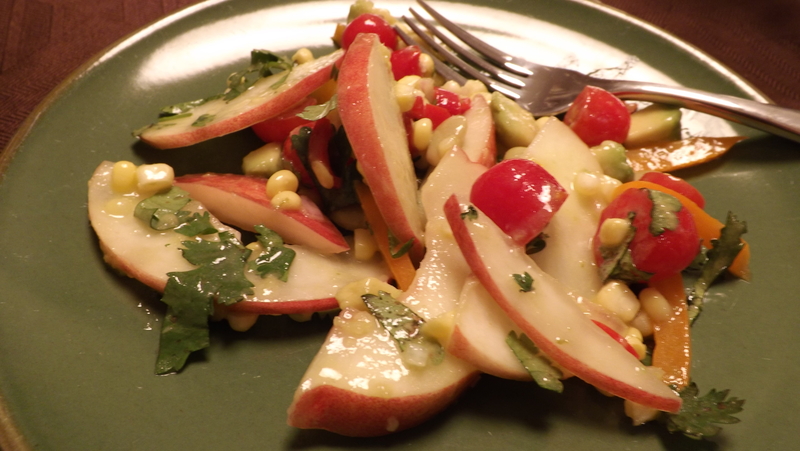 The combination of nectarines, avocados, corn, and cilantro is not something that I would have considered, but man, did we make quick work of that ceviche. And now on to the main course. Despite the presence of some meat recipes in the August issue, I chose to bite the bullet and go veggie. 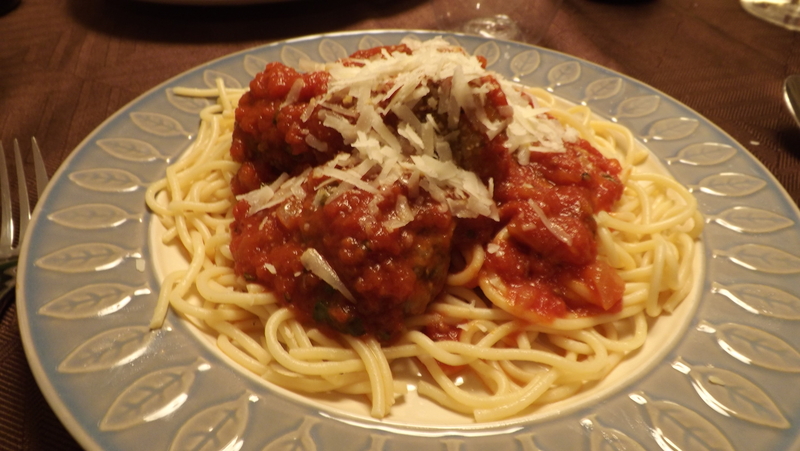 I made Eggplant and Porcini ‘Meatballs’ in Tomato Sauce; we affectionately called them plantballs throughout the evening. After last month’s issues with the pork burgers, confidence in my ability to create a spherical plant ball that stayed intact was a little low, but they turned out amazing! The recipe was surprisingly easy to follow despite the complicated sounding title, and I found it actually took less time to make than the allotted two hours. This dish was another interesting twist on a meaty classic. Normally, I am one who tends to criticize cooks who try and turn one food into another (i.e. using that weird vegan ‘cheese’: it’s not cheese) but this recipe was solid. The combination of porcini mushrooms, eggplant, and breadcrumbs created a great plantball, they were so savoury, and stayed together just as well as any meatball could. The fresh tomato sauce was the perfect vessel for the plantballs and everyone at the table loved the innovation of a classic comfort food. It turned out great! 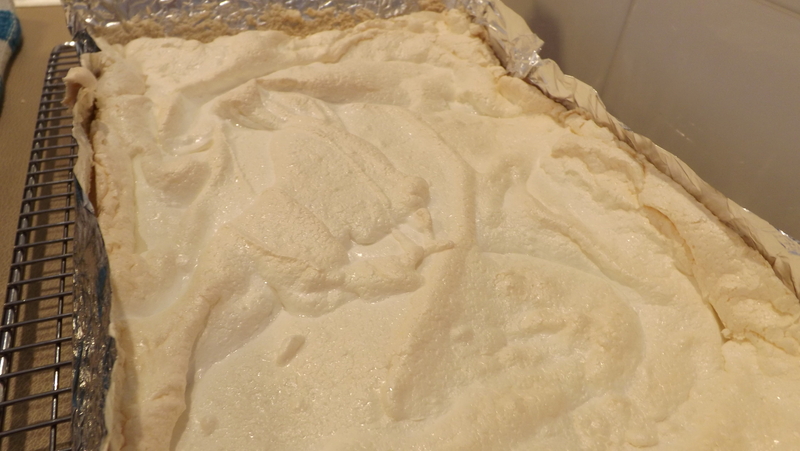 The tricky part was actually rolling the meringue with the Kirsch flavoured cream and berries inside, but the finished product was unbelievable! 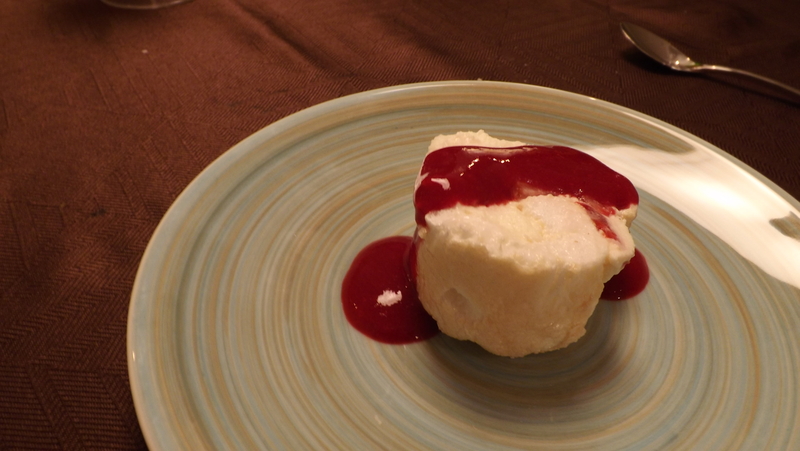 After freezing the roulade for a couple of hours, it was a matter of slicing and smothering it in the delicious raspberry sauce. I don’t normally prepare desserts for the recipe challenge, they aren’t my forte, but everyone was so glad that I did. YUM! For the wine, I asked Erin and Matt to select a fruity Sauvignon Blanc to pair with the Ceviche and a bold red to go with the Spaghetti and Plantballs. The sauvignon blanc was a Nederburg from South Africa and its fresh fruitiness was the perfect compliment to the summery veggies in the ceviche. The red was a medium bodied wine from Italy. 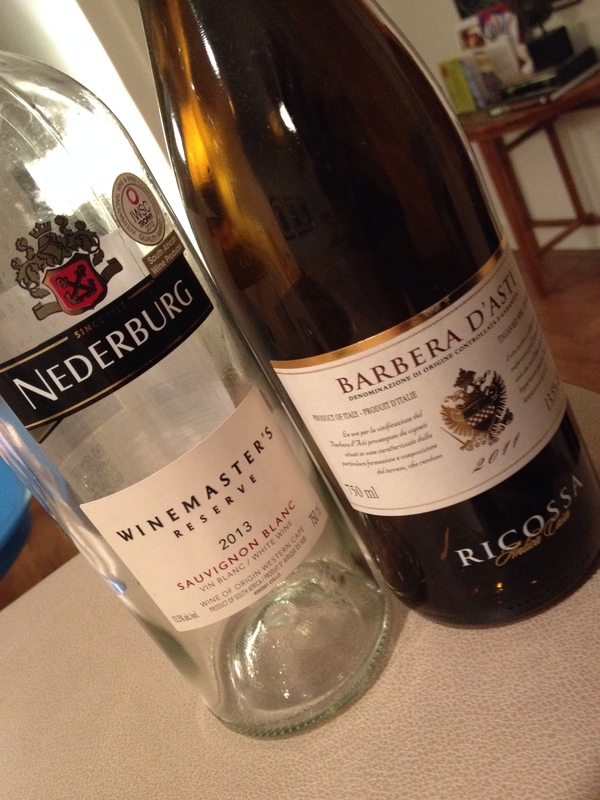 The Ricossa Barbera d’Asti is an amazing wine for a great value. It was the house wine red at Get Stuffed when I worked there, and has been for ages. It went perfectly with the Eggplant and Porcini Meatballs. Overall the meal was a complete success. Compared to last month’s frustrations, August’s F&W Cover Recipe Challenge was a pleasure to make and even more of a pleasure to eat. I was surprised at the versatilely of vegetables in the dishes that I prepared, and I will definitely be working on more meals that have veggies as the star. 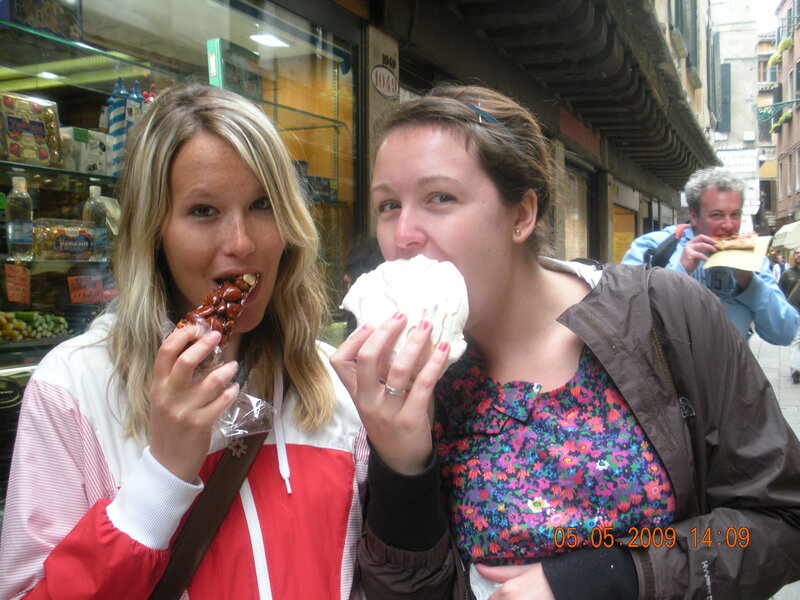 I encourage everyone to Eat. Explore. Repeat. your local farmer’s market and try some new veg recipes asap! Enjoy!